People often tell me that when they apply too much ink during the blending process the ink starts to feather out beyond the stamped line. The first question I ask them is, "What paper are you using?" If you are using the wrong type of paper with your Copics, you are going to get very frustrated with the outcome! 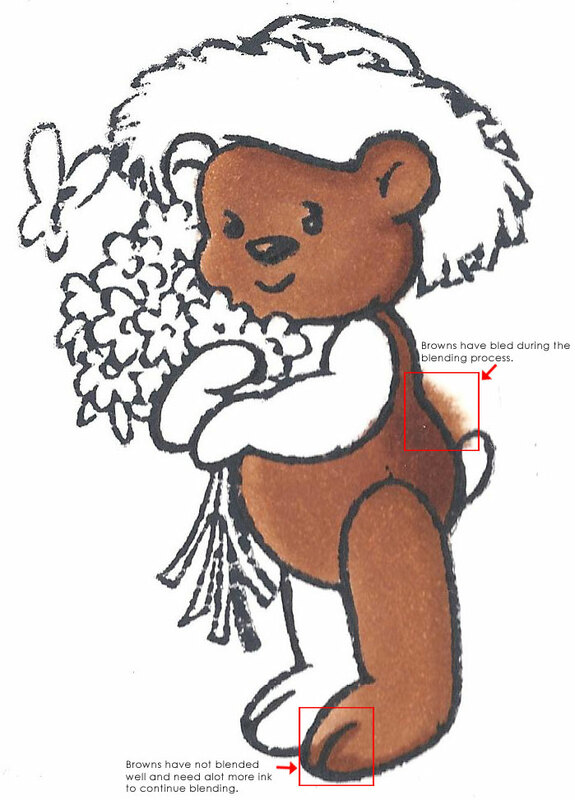 Here is an example of a teddy bear that I stamped using Neenah Cardstock, and as you can see the browns have moved and made a mess of the image. I also couldn't get a smooth blend and as such would have needed to keep adding a lot more ink to achieve a blend that I am happy with. 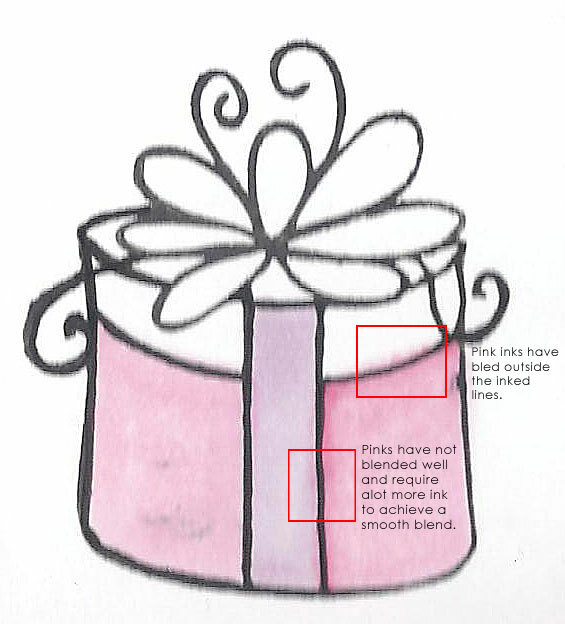 Here is another example using Pinks. Again I have marked the area where the Copics have feathered out of the image. I am definitely NOT happy with this quality of work! The paper that I use ALL the time is X-Press It Blending Card. This paper has been available for some time in Australia, but has just been released at CHA in America. This paper is taking the Copic World by storm! If you have not yet used it ... RUN ... as fast as you can to your Copic stockist, and pick up a pack for yourself! I am no longer frustrated with the outcome of my work. Instead I love the Copic Colours as they are bright and vibrant on this paper. 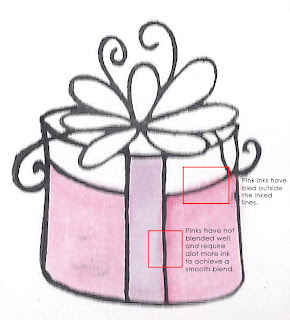 As you can see in the example below, I am able to achieve a brilliantly smooth blend between my colours, but most importantly the ink stays where it is meant to be. I am able to use a lot of ink to really saturate the fibers of the paper and still my colours wont feather out! Don't forget to enter Kathy's Flower Challenge. You still have time to create something remarkable. This is such a fun challenge .... and the prize is great too!!! 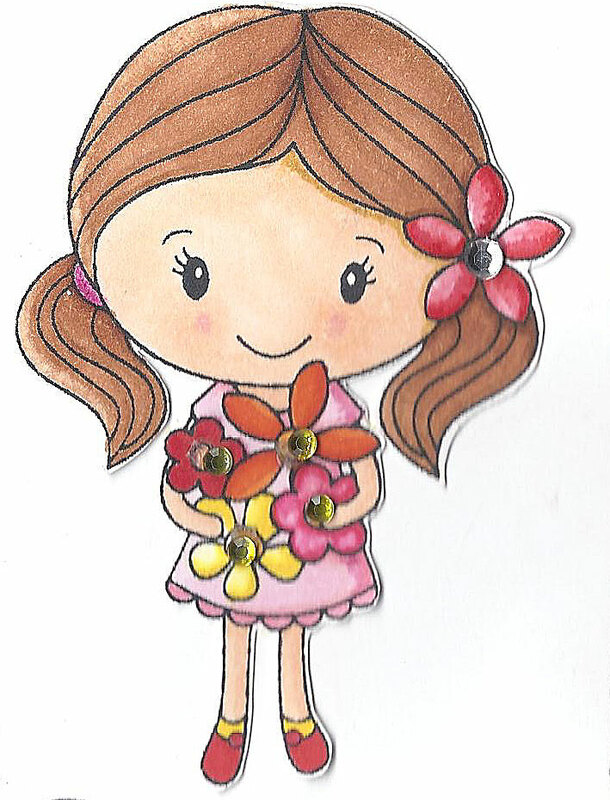 You can also join me at Paperific on the (27th, 28th and 29th August) for a 2 Hour Colouring with Copic Class. Click Here for more information or to book your spot! I'm from the USA and this paper has been mentioned on so many blogs lately. I stopped using my Copics because I just don't care for the results. Now that I've learned about this product, I'll be giving it another go. Thanks for the comparison. So Mandi - where can we get our hands on this paper?? Thank you very much for putting together this post. I'm new to the world of Copics and haven't been having any luck with the white cardstocks (The Paper Company, Best Occasions, and Bazzill) that I have on hand right now. 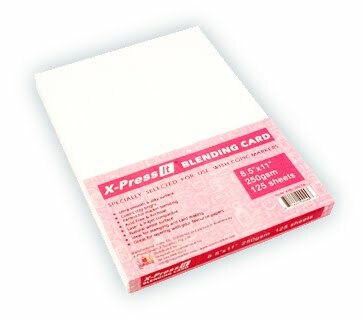 I'll definitely try to find someone up here in Canada who stocks the X-Press It Blending Card. Your blog is very helpful. Thanks for sharing the valuable information regarding Press pass.